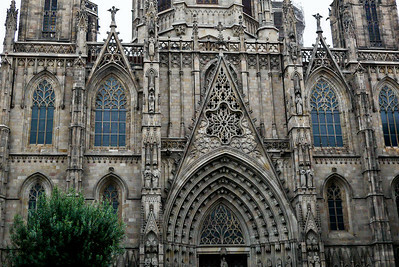 The gothic architecture and cobblestone streets of Barcelona. 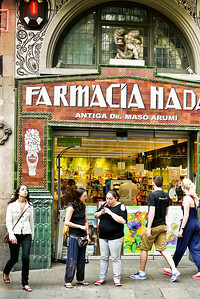 The corner pharmacy in Barcelona has a pretty storefront. 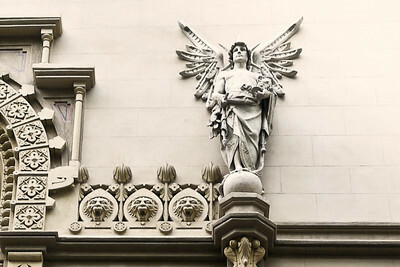 Pretty details and carvings on the buildings in Barcelona, Spain. 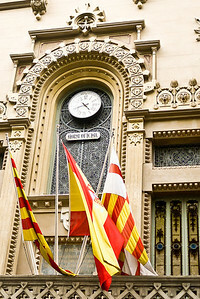 Spanish and Catalan flags wave from a building in Barcelona, Spain. 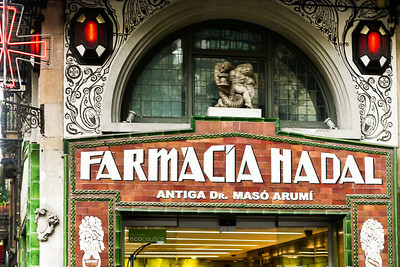 The pretty storefront and carvings of the local pharmacy in Barcelona, Spain. 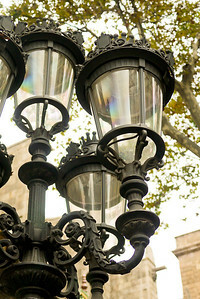 Light posts on Las Ramblas in Barcelona, Spain. 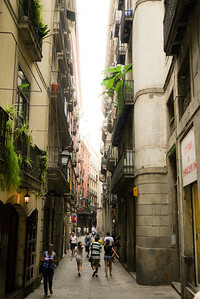 The thin streets of the Gothic Quarter in Barcelona, Spain. 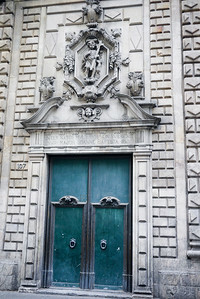 Doorway in the Gothic Quarter of Barcelona, Spain. 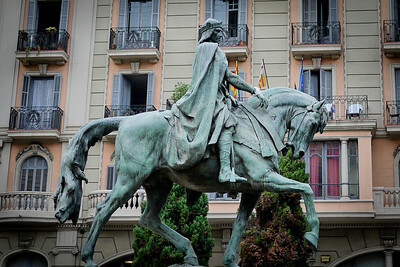 Statue in a roundabout at the waterfront in Barcelona, Spain. 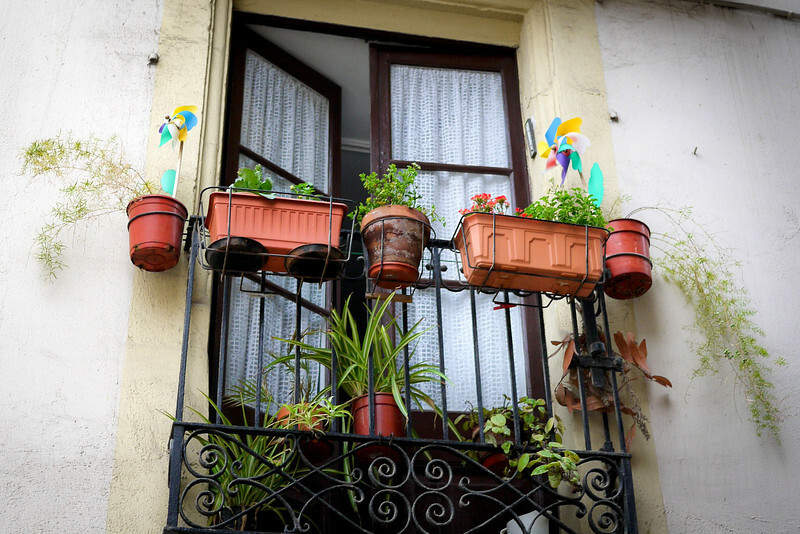 A gorgeous roundabout centerpiece in Barcelona, Spain. 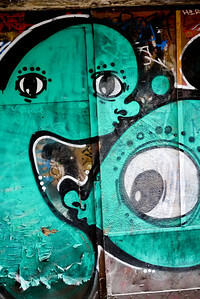 Street graffiti in Barcelona, Spain. 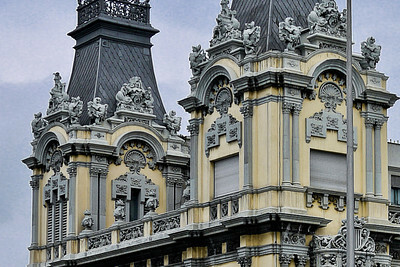 Pretty architecture to keep with the feel of the historic city in Barcelona, Spain. 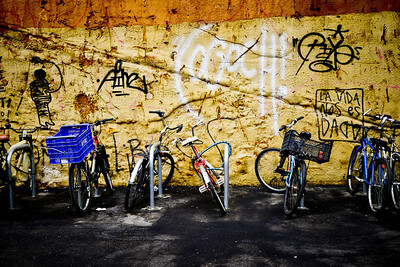 Graffiti and bicycles in the Old Town area of Barcelona, Spain. 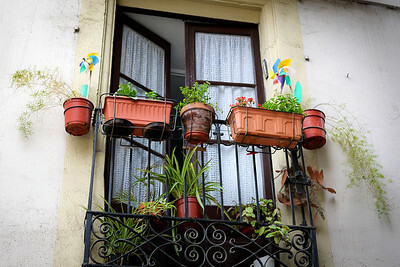 An apartment takes advantage of window space with flower pots and herbs in Barcelona, Spain. 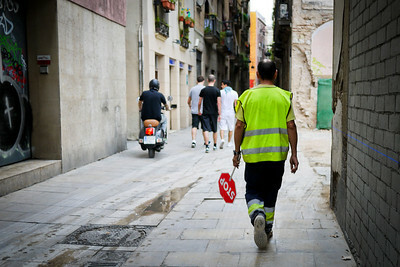 A construction worker the Old Town in Barcelona, Spain. 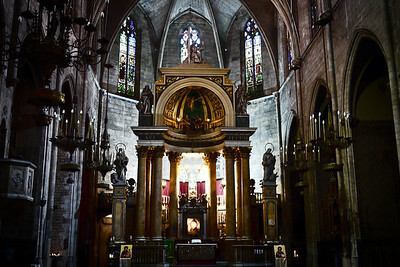 The beautiful Santa Maria del Mar church in Barcelona, Spain. 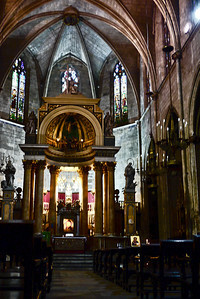 Santa Maria del Mar, a gorgeous church near the Gothic Quarter in Barcelona, Spain. 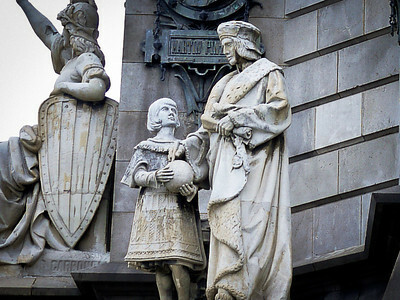 Delicate statues and carvings on the churches of Barcelona, Spain. 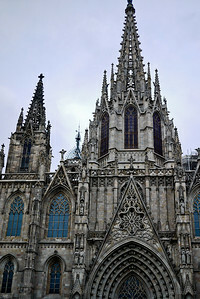 The edifice of Santa Maria del Mar in Barcelona, Spain. 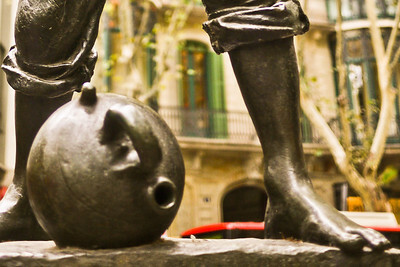 A random statue in Barcelona, Spain. 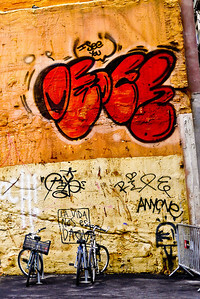 The streets of Barcelona, Spain. 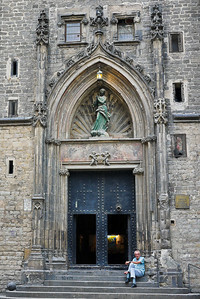 The side entrance to the Santa Maria del Mar church in Barcelona, Spain. 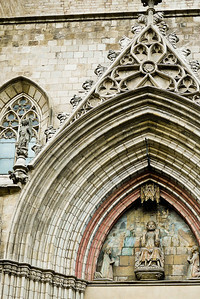 The gorgeous entryway to Santa Maria del Mar, a church with Catalan Gothic styles, in Barcelona, Spain. 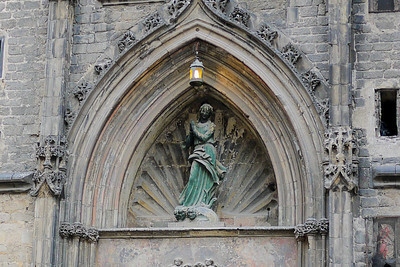 Santa Maria del Mar in Barcelona, Spain. 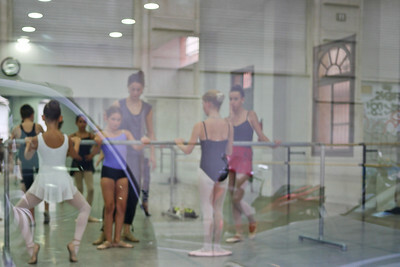 Young girls learn ballet as I look on through the glass on the streets of Barcelona, Spain. 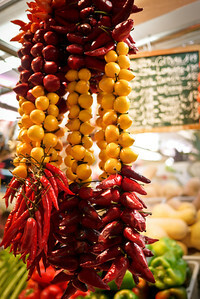 La Boqueria market in Barcelona, Spain. 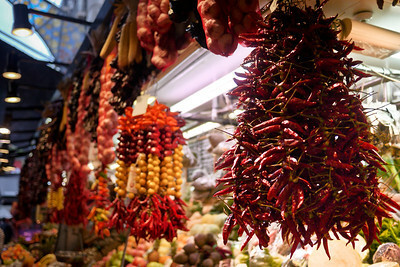 Chilies for sale in la Boqueria market in Barcelona, Spain. 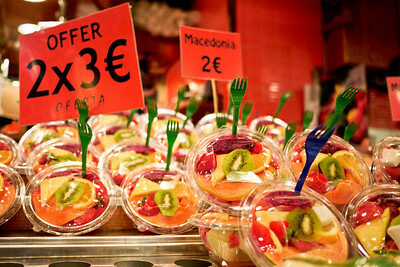 An array of fresh chopped fruit for sale in la Boqueria market in Barcelona, Spain. 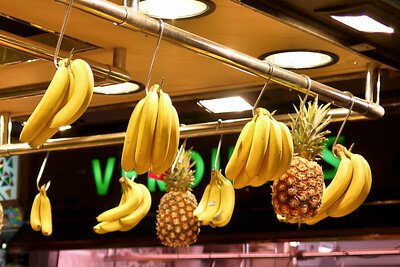 Fruit for sale in la Boqueria market in Barcelona, Spain. 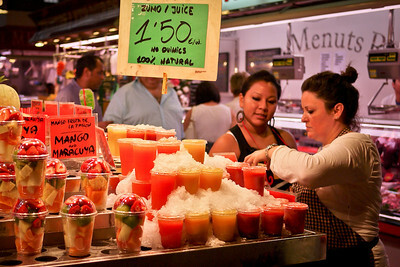 A vendor sells fresh juices in la Boqueria market in Barcelona, Spain. 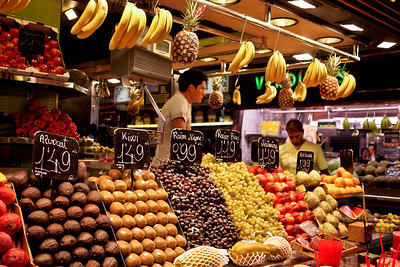 Fresh fruits are prettily arranged at la Boqueria market in Barcelona, Spain. 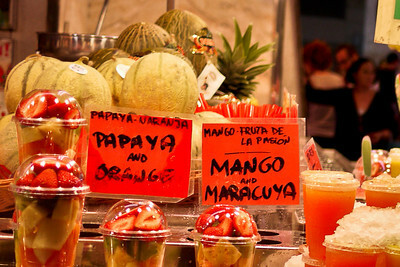 Fresh fruits in Barcelona, Spain at la Boqueria market. 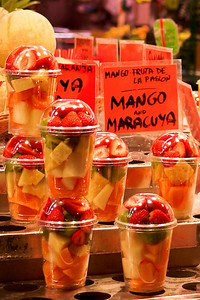 A quick snack of fresh fruit at la Boqueria market in Barcelona, Spain. 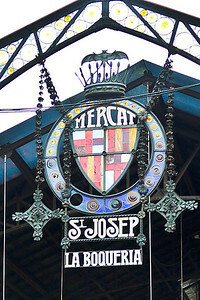 The Mercat de Sant Josep de la Boqueria in Barcelona, Spain. 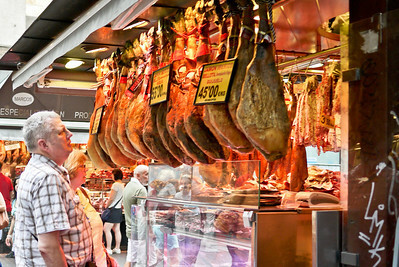 I am just as miffed by the dead animal as these folks, at la Boqueria market in Barcelona, Spain. 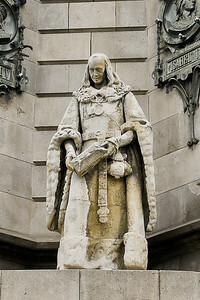 A statue in Barcelona, Spain near Placa Catalunya. 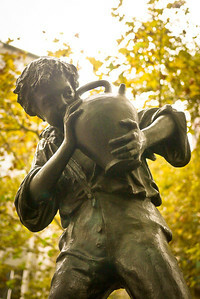 A statue of a boy drinking from a jug in Barcelona, Spain. 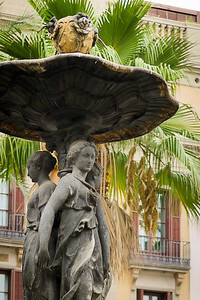 A pretty fountain in a courtyard of the Plaza Real in Barcelona, Spain. 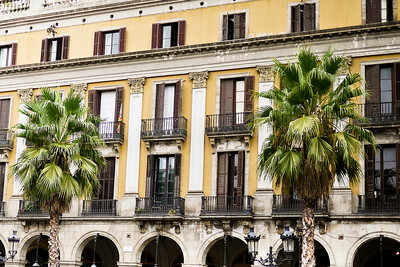 The incredibly busy streets surrounding the Placa Catalunya in Barcelona, Spain. 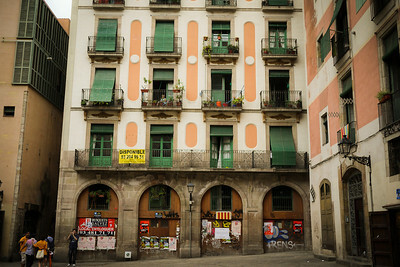 Plaza Real in Barcelona, Spain. 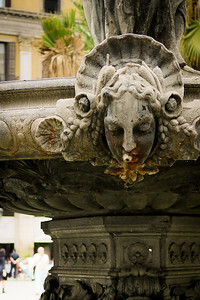 Up close with the fountain in the Plaza Real in Barcelona, Spain. 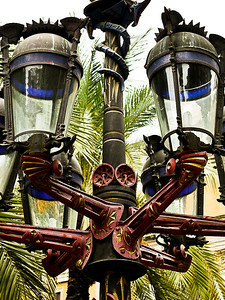 Intricate street lights in the Plaza Real in Barcelona, Spain.